This is a book about one of the most controversial concepts in economics: the invisible hand. The author explores the unintended social consequences implied by the invisible hand and discusses the mechanisms that bring about these consequences. The book questions, examines and explicates the strengths and weaknesses of invisible-hand type of explanations of emergence of institutions and macro-social structures, from a methodological and philosophical perspective. 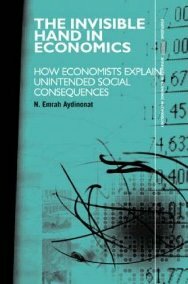 Aydinonat analyses paradigmatic examples of invisible-hand explanations such as Carl Menger’s ‘Origin of Money’ and Thomas Schelling’s famous checkerboard model of residential segregation in relation to contemporary models of emergence of money and segregation. Based on this analysis, he provides a fresh look at the philosophical literature on models and explanation and develops a philosophical framework for interpreting invisible-hand type of explanations in economics and elsewhere. Finally, the author applies this framework to recent game theoretic models of institutions and outlines the way in which they should be evaluated. Covering areas such as History, Philosophy of Economics and Game Theory, this book will appeal to philosophers of social science and historians of economic thought as well as to practicing economists. Read the Introduction to the book here or on ResearchGate. Conjectural models aim at devising the initial conditions required for individual actions to generate a given social phenomenon as unintended consequence. Social scientists make frequent use of this modeling technique. Indeed the list of those who have applied it – from Smith to Menger, from Schelling to Lewis – reads likely a veritable “who’s who” of the last 250 years of social sciences. Yet the question of how these purely speculative models may actually enjoy any explanatory power with respect to real world phenomena has only rarely been tackled. Aydinonat’s outstanding work fills this gap by thoroughly investigating the philosophical and methodological challenges posed by conjectural models and by developing a coherent and persuasive framework to account for the role of abstract theorizing in the social sciences. The book is a candidate to become compulsory reading for methodologists and philosophers of science, as well as for those economists who take seriously the issue of their models’ epistemological foundations. There is a long tradition in the social sciences, going back to Adam Smith, of explaining social phenomena as the unintended consequences of human actions. In this illuminating book, Aydinonat investigates the structure of such explanations and the nature of the claims that can legitimately be derived from them. In the process, he analyses some of the classic ideas in social theory – Smith’s invisible hand, Carl Menger’s explanation of the emergence of money, Thomas Schelling’s analysis of racial segregation, and David Lewis’s theory of convention – with acuity and subtlety. This is a significant contribution to the philosophy of social science which will also engage the interest of reflective economic theorists. The book’s choice of the topic with which economists and philosophers could start engaging each other cannot be improved on. The notion of the invisible hand, and the type of explanations it gives rise to, of social patterns of behavior as unintended consequences of individual actions and interactions, are just right for the cross-fertilization between a variety of philosophical ﬁelds, prominently including the philosophy of science, on one side, and economic theory, prominently including game theory, on the other. Moreover, the experience of reading this book leaves the reader feeling that the choice of author for this undertaking can hardly be improved on either. This study by a sensitive and imaginative intellect is a substantive contribution to the literature developing the meaning of the concept of ‘‘the invisible hand’’ while simultaneously attempting to establish how interpretation can be structured to convey ‘‘understanding’’ albeit not ‘‘truth.’’ (Read the review).